Biddy Collyer paid an early morning visit to St Nicholas church in Blakeney to see for herself the tasty welcome that’s taking the place by storm. The wonderful smell of bacon being cooked welcomed me as I entered on the first Wednesday of May. 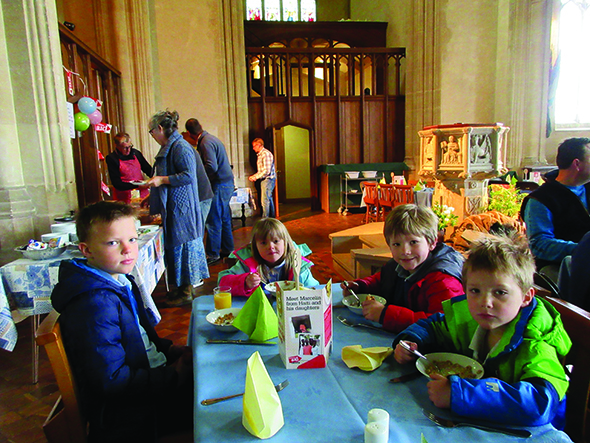 The rear of the church was laid out with tables and chairs, colourful napkins at each place setting and a real buzz of excitement as the children started arriving. Twelve months earlier, the church decided to put on a Christian Aid Big Brekkie. It was such a success that a small team of amazing volunteers, headed up by Alison Jewell, a member of the Blakeney PCC, decided to do it again the next month. A year on and it is still taking place monthly each first Wednesday, feeding around 60-plus children and parents in the early shift and over 100 in total during the morning. This is no small feat. Volunteers staff the kitchen producing appetising bacon and egg butties, scrambled egg with bacon, porridge, toast and cereals with a choice of tea, coffee and juices. Front-of-house is headed-up by Alison, with yet more volunteers taking orders and serving the tables. Talking to Victoria Cowan’s children, William, Sophie, Henry and Ben, it was clear that what they enjoyed was the hot food and sharing it with their friends. I heard the same comment from every child I spoke to. Getting children off to school is hard enough anyway without having to nag them to eat up. In the relaxed atmosphere of the church, they needed no encouragement. The parents I spoke to were equally enthusiastic. Victoria said, “It is lovely just getting the village and community together. It’s been brilliant.” Sarah Bracey’s son William added, “It’s a nice start to the day.” It is helped by the fact that the church school is next door, so it only takes a few moments for them to walk to their classrooms. Apparently, the teachers have noted that the children concentrate better on the mornings of the breakfast. Everyone is welcome. There is no charge, but people are invited to donate. After costs, between £150 and £200 is raised for church funds. Barbara Bent, one of the churchwardens, reckoned that the bacon sandwiches were better than any hotel. Once the children leave, there is a lull before the pop-up restaurant fills up again when older members of the community arrive. Such was the success of the breakfast that a few months later, it was suggested putting on a lunch. So, on the third Wednesday each month, the church is open for a meal of homemade soup and rolls, followed by a dessert. There is a regular attendance of around 60. On the morning I was there they had to send out for more eggs. If word gets about, they could start having to send out for more bacon too!